Patrickswell Brownes: ". . . and he leaves a large family to mourn his death"
". . . and he leaves a large family to mourn his death"
buried in St. Mary’s Cemetery in the same plot as that of his wife, Ann Burns Brown. 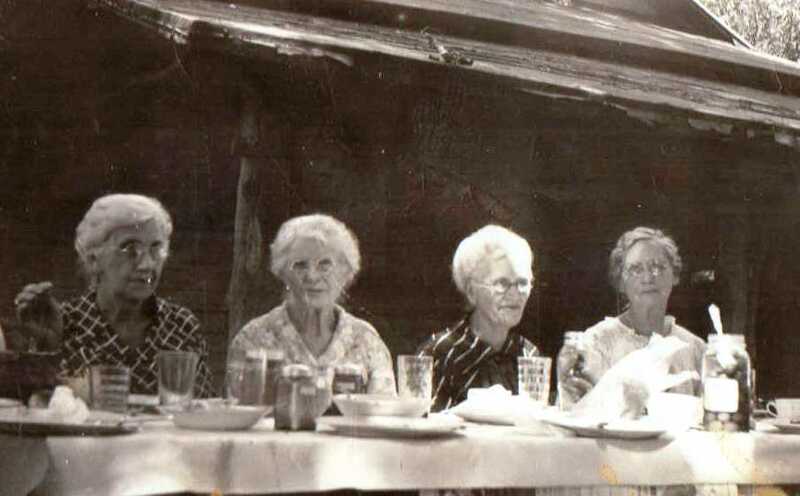 Patrick and Ann raised nine children, each of whom married and had families of their own. It has always been my intention to tell the story of each of the immigrants who arrived in Boston from Ireland in January 1849. Patrick is not my direct ancestor. Out of respect for his descendants, and because I feel additional information is their story to tell, I will end Patrick’s story with a brief account of each of his children. However, since this is a blog about the family, if any of Patrick’s descendants have information or a story they would like to share, I welcome their thoughts and memories and invite them to post the narrative here. The next blog post will begin the story of John Brown, third child of Timothy and Hannah Brown. March 17, 1854. By 1865, the family was living in Belleflower Township, McLean County, Illinois having lived in Delaware County, Ohio for a few years before then. On January 8, 1880, he married2 Anna Radigan in DeWitt County, Illinois, and is shown as a farmer with his wife in the 1880 US Census for McLean County, Illinois. Subsequent to this, he lived in Bloomington until his death in 1935. The Blooming City Directory for the 1880s identifies him as a miner. He later worked for the railroad as a brakeman and machinist. Patrick was living with his youngest son, Jerome, when he died of heart disease on February 28, 1935.3 His wife, Anna, died June 23, 1953.4 Both are buried in St. Mary’s Cemetery, Bloomington, Illinois. Patrick and Ann had five children: Frank, John P., Jettie (Mrs. William B. Young), Thomas, and Jerome. The twins, John B. and Mary Ann were baptized April 3, 1856 at St. Patrick’s in Columbus, Ohio. Mary Ann lived in the family home in Belleflower, Illinois, keeping house after the death of her mother in 1878. She married James F Cox of Gibson City, Ford County, Illinois on January 13, 1881 when she was 25.5 On February 10, 1882, she and James purchased property from her father, Patrick – the same home where she and James were married. They resided there until the farm was sold in January 18886 when they moved to Nobles County, Minnesota where James was involved in farming and real estate. They returned briefly to Bloomington between 1910 and 19207, only to move back to Minnesota where James died December 21, 1925 in Kandiyohi County8. Mary Ann returned to Bloomington after the death of James, where she died on March 22, 19309. Both are buried in Willmar, Kandiyohi County, Minnesota. Mary Ann and James did not have children. While Patrick was the first of the children to marry, John B. was one of the first of the children to move away from Illinois. John homesteaded in Nebraska by November 1883.10 He secured a homestead of 160 acres near Berwyn in Custer County, Nebraska (section 3, township 16N, and range 19W). The patent was finalized November 1, 1890. 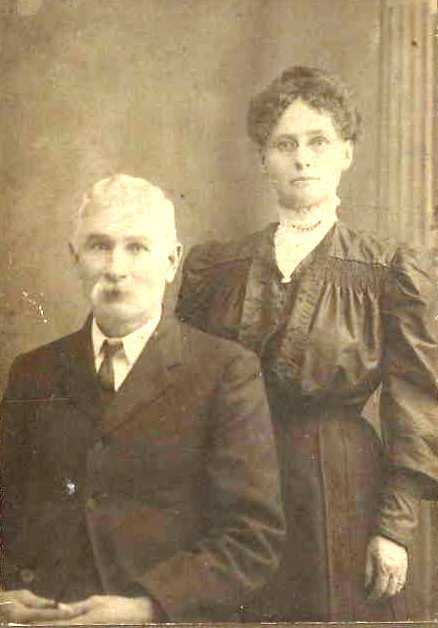 John married Nancy Violet Burdick on September 9, 1889.11 John continued farming the homestead until 1909 when he moved to the city of Broken Bow where he sold insurance for the Union Fire Insurance Company. He continued in this occupation until he died of heart disease on May 15, 1926 at Clarkson Hospital in Omaha12. Violet and John B. had four children: Cecil Vern, James Carlton, Cyril B., and Mary Violet (Mrs. Charles L. Heaps). Both John and Violet are buried in the Ansley Cemetery, Ansley, NE. David O. (known as D.O. ), was baptized January 2, 1859 at St. Mary’s in Delaware, Ohio and moved to Illinois with the family about 1865. D.O. also homesteaded in Nebraska in the early 1880s as did his wife, Agnes Price, and some of her family.13 (See discussion in previous post.) This extended family eventually controlled large tracts of land in sections 29, 30, 31 and 32 in township 17N, range 21W of Custer County14 with David Jr. (Otis), son of D. O., controlling 420 acres in 1919 after D.O.’s death.15 D. O. and Agnes had four children. Three girls, June Agnes (Mrs. Edward Friedman), Mary Ada/May (Mrs. Lawrence Booth), and Fern M. (Mrs. Roy Aldridge) were born in Nebraska. A son, David O. Jr., was born in Carroll County, Ohio in November 1893 just after D. O. finalized a Timber Culture claim in Nebraska. Agnes and the girls remained in Ohio. D. O. was enumerated in Carroll County, Ohio in 1910, but was living in Lincoln, Nebraska at the time of his death, November 16, 1916.16 His son, David Jr., lived in Nebraska for some time, but had returned to Ohio by 1920.17 Agnes lived in Ohio until her death on June 11, 1934.18 Both D. O. and Agnes are buried in the New Harrisburg Cemetery in Carroll County, Ohio. 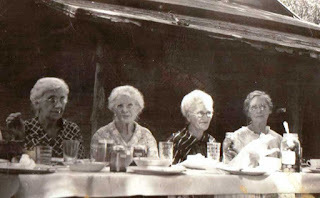 Elizabeth Agnes Brown was born in Saybrook, Illinois July 23, 1865. Elizabeth (Lizzie) married John McDonald September 28, 1884, at Merna, Illinois.25 John was born in Ireland about 1843 and emigrated to this country at an early age settling in McLean County, Illinois where he purchased 160 acres in Towanda Township in January 1869.26 He farmed the property until he died of the “grip” on January 26, 1901.27 In 1910, Elizabeth and six children were living in Monument Township, Logan, Kansas with Lawrence McDonald, John’s brother.28 By 1920, Elizabeth had returned to Illinois and lived in the city of Bloomington until her death on August 8, 1939.29 John and Elizabeth had eight children, Anna Ellen/Nellie (Mrs. Daniel G. Carmody), Sarah Mae (Mrs. Frank D. Hackett, Anna Isabella/Hannah, John E. (Jack), Lawrence, Eugene, and Mary (Mrs. William E. Hogan) who was born after the death of her father. There was also an unidentified child born and died before 1900. Both John and Elizabeth McDonald are buried in Holy Cross Cemetery, Merna, McLean, Illinois. Emily Julia Brown, who later went by the name Julia Emily, was born October 1, 1868 in McLean County, Illinois.30 In 1891, at the time of her father’s death, Emily Julia Betebenner was living in Alliance, Box Butte, Nebraska. The 1900 US Census for Alliance, Nebraska states that she and her husband, George Betebenner, had been married nine years, making her marriage date shortly before Patrick’s death. Emily Julia and George resided in a number of places including Alliance, Nebraska, Hot Springs, South Dakota, and Ravenna, Nebraska. George was a veteran conductor on the Burlington railway, (Chicago, Burlington and Quincy Railroad) and died in 1918 as a result of an accident.31 He is buried in Grand Island Cemetery, Grand Island, Nebraska.32 By 1920, Julia was living in Boise, Idaho; by 1930 she was living in the Los Angeles area where she remained until her death on February 3, 1959. Julia is buried in Glen Haven Memorial Park, Sylmar, Los Angeles, California.33 Julia and George had four children, Harry E., James Lyle, Florence Fay (Mrs. Harold Rose), and Mary Bernice (Mrs. George Robert Martin). 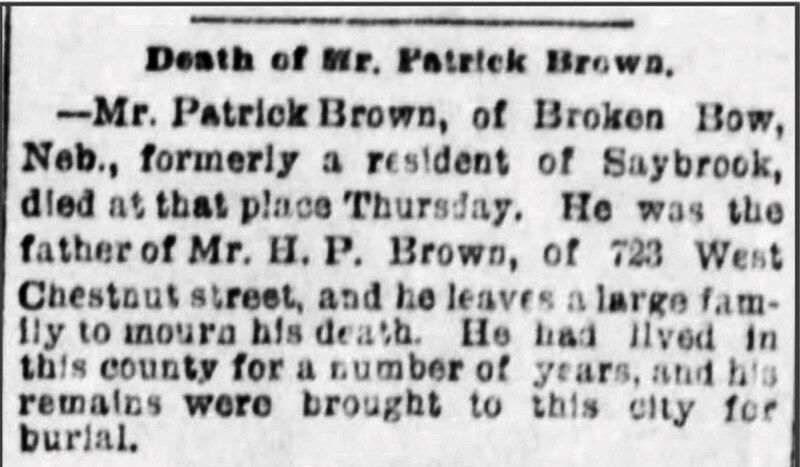 Custer County Republican, A Tragic Death, Broken Bow, NE, September 10, 1891. See copy of that article in a previous post. 3. Certificate of Death #95, Registration Dist., No. 696, 1935, McLean County Vital Records Office, Bloomington, IL. 4. Find A Grave, database and images (http://findagrave.com: accessed 15 Nov 2016), memorial page for Anna Radigan Brown (1861-1953), Find A Grave Memorial no. 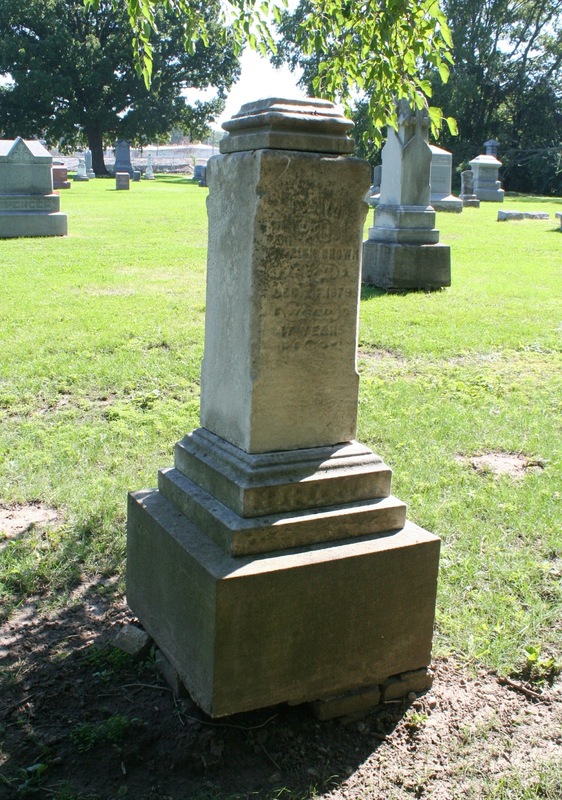 14081010, Saint Marys Cemetery, Bloomington, McLean County, Illinois. 5. The Pantagraph, “Mr. James Cox, of Gibson City, and Miss Mary E. Brown, of Belleflower, were married January 13th, at the residence of the bride’s father, Mr. Patrick Brown, by Rev Father Kelly, of Loda, Ill. Eighty invited friends were present. A fine supper was served, and many substantial presents were made. They have the best wishes of a host of friends.”, Bloomington, IL, January 20, 1881, page 3. 6. McLean Co., IL, Deed Book, Book 151, page 260. James Cox to John W. Lucas, dated 31 January, 1888. 8. The Pantagraph, James F. Cox Died in Willmer, Minn., Bloomington, IL, December 23, 1925, page 6. 9. The Pantagraph, Mrs. Mary Cox Dies; Widow Succumbs – Had Been Patient in St. Joseph’s Hospital, Bloomington, IL, March 23, 1930, page 3. 11. Information from “Brown” family file at the Custer County Historical Society, Broken Bow, NE. Accessed, September 2011. Extended family consisted of Mary Elizabeth Jeffords, wife of Charles Jeffords, John Reed Price and John R. Price, father and brother of Mary E and Agnes. 16. Certificate of Death #10775, 1916, Nebraska Department of Public Welfare, Bureau of Health – Division of Vital Statistics, Lincoln, NE. The Lincoln Star, Deaths, Lincoln, NE, November 16, 1916, page 2. “David O. Brown, a traveling salesman, living at 210 South Eleventh street, died at 11 a.m., Thursday at a local hospital, where he was taken Wednesday. Mr. Brown was a representative of the George S. Cran Atlas company of Chicago. Funeral arrangements have not been made. 19. I feel a special affinity for Sarah since David Brown, the letter writer, referred to her frequently in his letter and she was likely a source for much of the information that we have today. 20. Ford County Illinois Marriage Register, Sarah Jane Brown to William E. Taylor, Illinois Regional Archives Depository, Normal, IL. Accessed, September 2006. Record shows that William, age 27 lived at Merna, McLean, Illinois. His parents were William Taylor and Bridget Donahue. Sarah, age 21, whose parents were listed as Patrick Brown and Ann Burns, lived in Saybrook, Illinois. Witnesses to the marriage were Jas Donohoe and Lizzie Brown. 21. 1910 US Census record, Westside Township, Nobles, Minnesota. There was probably another child that did not survive born between 1884 and 1887, the dates of their marriage and the birth of Mary Ann. The 1910 US Census shows eight children born to the couple with six living. Seven children can be accounted for. 22. Find-A-Grave, database and images (http://findagrave.com: accessed 15 Nov 2016), memorial pages for William E. Taylor (1895-1935) and Sarah Jane Taylor (1853-1953) Find A Grave Memorial nos. 28353549 and 28353550, Saint Adrian Cemetery, Adrian, Nobles County, Minnesota. These are probably the correct graves; however, information for William, shows his date of birth as June 2, 1895 – the same date as his daughter Isabella who is also buried in the same cemetery. Sarah’s date of birth is given as November 27, 1853. We know Sarah was baptized in May, 1861. These are probably transcription errors which could be verified through death records and newspaper obituaries. 25. McLean County Illinois Marriage Register, Elizabeth Brown to John McDonald, Illinois Regional Archives Depository, Normal, IL. Accessed, September 2006. Record shows that John, age 35 lived at Merna, McLean, Illinois. His parents were Edward and Bridget McDonald. Elizabeth, age 19, whose parents were listed as Patrick Brown and Ann Burns, lived in Saybrook, Illinois. Witnesses to the marriage were David Brown and Emma Brown. 28. 1910 US Census, Monument, Logan, Kansas, Roll: T624_445, Page 4B, Enumeration District 0086. Certificate of Death: Elizabeth Agnes McDonald. Filed 10 Aug 1939. State of Illinois, Dept of Public Health-Div of Vital Statistics, Reg. Dist. No. 696, File No. 32771, Registered No. 328. 30. Ancestry.com, California Death Index, 1940-1997 [database on-line]. Original data: State of California, California Deaath Index, 1940-1997. Sacramento, CA, USA: State of California Department of Health Services, Center for Health Statistics. Julia Emily Betebenner, born 1 Oct 1868 in Illinois; died 3 Feb 1959 in Los Angeles, CA. 31. The Alliance Herald, available at Newspapers.com, carried several news articles about the Betebenner family from 1904 to 1918 including an account of the accident that caused the death of George Betebenner. February 21, 1918, p.1 . . . “Conductor G.W. Betebenner was thrown from train No. 40 today near Mason City [NE], and very seriously injured, his right are [arm], nose and jaw being broken. Mr. Betebenner was taken to the Hospitay [hospital] at Grand Island where he is reported to be in critical condition. Mr. Betebenner was standing on the rear platform, when in some way the rear trucks left the track, the violent jerk throwing him off. The train was going about 25 miles per hour at the time. Mr. Betebenner is an old conductor on the road, his run being 39-40, between Ravenna [NE] and Seneca [NE]. Many Alliance people know Mr. Betebenner as he formerly lively [lived] at Alliance. 32. Find A Grave database and images (http://findagrave.com: accessed 15 Nov 2016), memorial page for George William Betebenner (1867-1918), Find A Grave Memorial no 106317936, Grand Island Cemetery, Grand Island, Hall County, Nebraska. 33. Find A Grave database and images (http://findagrave.com; accessed 15 Nov 2016), memorial page for Julia E. Betebenner (1868-1959), Find A Grave Memorial no 142991050, Glen Haven Memorial Park, Sylmar, Los Angeles County, California. 34. The Mason City Globe-Gazette, J. P. Lynch, 72, Dies Following Illness in Home, Mason City, IA, April 5, 1937. 35. Find A Grave database and images (http://findagrave.com; accessed 15 Nov 2016), memorial pages for Joseph P. (1865-1937)and Hannah K. Lynch (1872-1970), Find A Grave Memorial nos. 6526342 and 6526343, Elmwood Saint Joseph Cemetery, Mason City, Cerro Gordo County, Iowa. While researching Nebraska marriage records for a future post, I ran across a marriage record in Box Butte County, Nebraska for James E. Brown to a Jennie Phillips. The marriage was dated August 26, 1888. The witnesses were David Brown (either the brother of James or a cousin and son of John Brown and Ellen Burns) and John Phillips. The parents for James are given as Patrick Brown and Ann Burns. The original research for James (see above) identified Jennie Barney as his wife with a marriage date of 1894. Jennie Barney's place of birth was consistently shown as Missouri in all of the census records. This Jennie Phillips gives her birthplace as New York. I believe this is perhaps a first marriage for James Brown. Further research is needed to find additional information. Hello. I have a parallel history in the Liston family who emigrated from County Limerick by 1850 and settled first in Litchfield, Connecticut. Very soon they went out to Bloomington, Illinois. These Listons were from the parish of Crecora, which is in the barony of Pubblebrien. Patrickswell was the location of the petty sessions court for the area, and an inlaw who married his Liston bride in Ireland stated he was born in Patrickswell. The Listons were married to Ryan and Spellman wives and raised their children in Bloomington. I am still trying to learn as much as I can about this family. One branch of the family has a Burns marriage, and the sports broadcaster and writer Robert Burns of St. Louis was a descendant. Hi! Thanks for stopping by. It certainly makes you wonder if these two families knew one another - both in Ireland and in Bloomington. All of those areas are within walking distance. I know I was confused when I first started researching - there are two Catholic parishes of "Patrickswell" within 20 miles of one another. One is Patrickswell & Ballybrown (Lurriga) where it sounds like both of our families are from. The other is Knockany & Patrickswell located just southeast of the town of Patrickswell. I read your blog. I am very interested to see how you discovered your family!